Stop Street Harassment study: How often women, gay men, and people of color are sexually harassed in public. Smile, Baby! A New Study Shows How Often Women and Gay Men Are Sexually Harassed on the Street. Fourty-one percent of women said they had experienced physical aggression in public. Whenever I write about the problem of the casual sexual harassment of women in public, someone inevitably attempts to derail the conversation by saying: “It happens to men, too.” And it does—but that’s not the whole story. 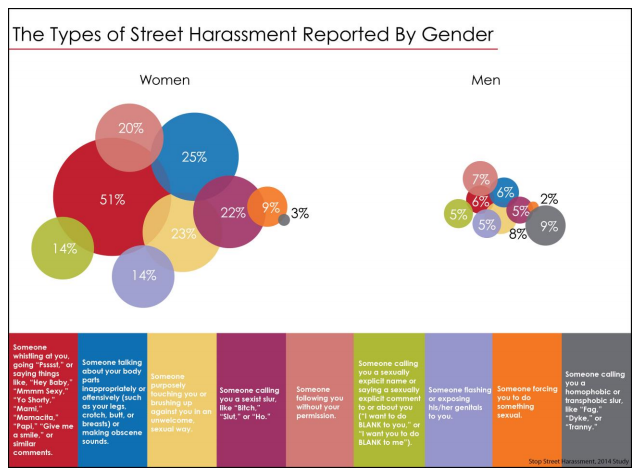 A new nationally-representative survey, released today by the advocacy organization Stop Street Harassment with the help of market research firm GfK, gives voice to the men who are harassed in public, while demonstrating just how gendered the phenomenon really is. The resulting report is based off a survey administered to 2,000 people across the United States, plus interviews with ten focus groups among marginalized people around the country, like Native Americans in South Dakota and gay, bisexual, and trans men in D.C. It found that 65 percent of women and 25 percent of men reported experiencing public harassment in their lifetimes. More than half of women in the survey reported experiencing verbal harassment, while 41 percent had experienced physical aggression in public: 23 percent of women reported nonconsensual sexual touching, 20 percent had been followed down the street, 14 percent had been flashed, and 9 percent had been “forced to do something sexual” while out and about. Meanwhile, 18 percent of men had experienced verbal harassment and 16 percent had experienced physical aggression in public. Eight percent of men said they’ve been touched nonconsensually, 7 percent had been followed, 5 percent had been flashed, and 2 percent had been forced to do something sexual. Women were also more likely than men to say the harassment “happened sometimes, often, or daily,” and were more likely to respond to the threat of harassment by “constantly assessing their surroundings” or avoiding walking alone. Julia, a 14-year-old Latina girl living in Florida, said that she had not yet been harassed, but still frequently altered her route in fear that she might be. In fact, the survey found that everyone who’s not a wealthy, straight, white man is disproportionately affected by public harassment. That includes women and LGBT people, but also lower-income people and people of color. Meanwhile, the people responsible for the harassment of both men and women were overwhelmingly male. Seventy percent of female victims and 48 percent of male ones reported being harassed by a lone man; 38 percent of the women and 25 percent of the men reported being harassed by a group of men; and 20 percent of male victims reported being harassed by a lone woman. (Some respondents chose more than one category of harasser; the race, class, and sexuality of harassers weren’t investigated as a part of the survey.) One way or another, street harassment is everybody’s problem. But like many forms of gendered violence, the ubiquity of the phenomenon serves to reflect the toxic power structures inherent in American society—not provide evidence of an equal-opportunity offense.